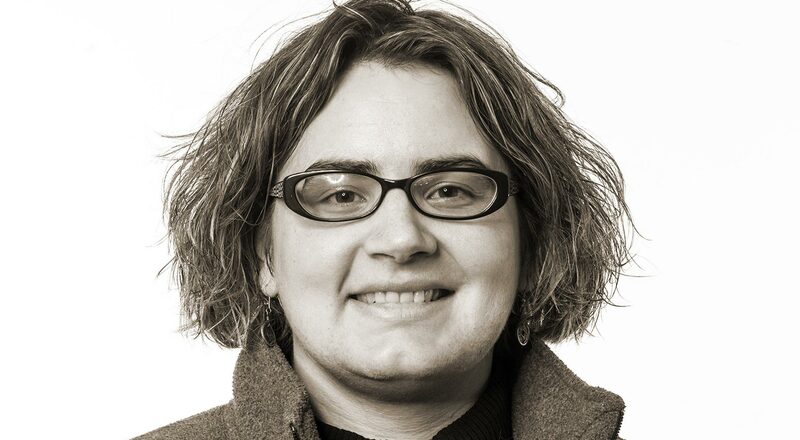 Kameron Hurley is best known as a science-fiction novelist whose future worlds explore gender, violence, and really mean-spirited mercenary assassins who will beat the crap out of you. Her latest book, though, is not science-fiction, and (mostly) dispenses with the assassins. The Geek Feminist Revolution is a collection of essays about, well, like the title says, geeks, feminism, and revolution. Some of the essays are personal, but many are critical discussions of film, science-fiction, and the science-fiction community. Criticism is often thought of as undercutting art, or as being parasitic on art. Does your critical writing or thinking distract from your fiction? Who thinks that criticism undercuts art? Criticism is a valuable part of the process of creation. Writing critical pieces about media that I love (and some that I don’t) absolutely makes me a better artist. It gives me the opportunity to break down a piece to understand what works and what doesn’t. That process often shows me where and how I want to change my approach to some of the same themes in my own fiction. If I can’t understand why something doesn’t work for me, I have no way of figuring out how to fix it in my own writing. Critical thought, learning how to break down a piece into its parts, is a good skill for any writer. The trick is learning how to turn off that part of your brain when you’re writing, and turn it back on when you’re editing. If you’re always drafting with your critical brain turned on, you’ll never finish anything. You have to wait until the words are down so that you can fix them. I will note that there’s a big difference between criticism and trolling, a distinction which may be more blurred these days. Getting up on a box and screaming that you hate someone for existing is very different from saying, “Here are the ways I found this work to be flawed, let’s break them down.” Critical thinking is a skill we could all do more with, especially in the age of the viral meme and bunk media. Nonfiction writing is just as much about storytelling as fiction writing. The skills are similar, but not the same. I know a good many novelists who are horrible nonfiction writers, and vice versa. What I find is that many writers assume that because they’re good at writing one type of story, in one type of medium, that that makes them an expert in all of writing. This is a silly and arrogant assumption. Screenwriting, novel writing, comics writing, essay writing… these are all very different types of work, and you need to study and practice each type in order to get good at it. You don’t write twelve novels and they say, “Yeah, I’m great at writing screenplays!” Because I can tell you now that if you’ve never written a screenplay, you are not good at writing screenplays. I write marketing and advertising copy for an ad agency, and I’ve gotten good at various types of writing there through study and repetition. I’ve literally written thousands of emails and direct mail pieces and copy for dozens and dozens of websites. It’s taken a lot of work to get good at writing those types of pieces, with lots of testing and failure. One of the reasons so many people struggle to write essays and stories is because they haven’t read and studied enough of them. The study part is important, there. One wouldn’t say that because they’d read a lot of comics that they were a good comics writer. You have to do the work. One thing you learn in writing essays online is that personal essays that employ a frame story tend to work very well. It’s the frame story – in the case of “We Have Always Fought,” it’s the llamas – that draws people through the piece and links all of the other disparate stories together into one unifying theme. I also call this the “sandwich” style of copywriting, which is to open with a theme or an anecdote, stuff your points and evidence into the middle, and then return to the theme or anecdote at the end, neatly tying it all together. I learned that not only through studying a lot of essays, but by writing hundreds of thousands of words of them for about ten years. I was able to see what sorts of essays got the most traffic, which received the most emotional and passionate responses, and which got dinged for being lazy, or which never gained traction. I steer clear of writing nonfiction work in the dry academic style favored by institutions because it’s just not accessible to many people. The success of “We Have Always Fought” was in its simplicity of language and story (not to mention good timing, as the subject [women’s history of fighting in wars and revolutions] was and is being heavily debated in media, especially gaming, circles). I didn’t use words like patriarchy, cisgender, or even feminism. Heck, there’s a reason I often just call it “We Have Always Fought” instead of using the full title, “We Have Always Fought: Challenging the Women, Cattle and Slaves Narrative,” because there are a good chunk of men who refuse to read anything about women (and then they wonder why they don’t think women are really human, or why they don’t understand women). Alas, those words would turn off the people who most needed to read that essay. So instead I told them a story about llamas. Who doesn’t love llamas? It’s a sad fact that if I’ve learned anything with this whole essay collection, it’s that people have more sympathy and empathy for llamas than women. Is there a difference between being a fan and a critic? Or, how do those two things fit together for you? Being a critic has certainly helped me define and refine what it is I want to achieve as a writer. One can love the aesthetic of the Mad Max movies while wishing that the narrative centered on someone else’s story, or treated more of its characters with humanity. I’m perfectly at ease being critical of the things that I love, because those things that I love so often didn’t include me. I used to twist myself up into knots, pretending that I was without a gender, or that I was a boy, because that was who all the stories were about. Those were the people who did things. I wanted to be someone who did things, not someone waiting around to be the sidekick or love interest in someone else’s story. Over time I realized that this feeling could be overcome by reading stories about people like me who had those same adventures. I didn’t feel so much like the world wasn’t meant for me, or that I was the wrong shape for the world. What I tell so many folks who feel the same way – this feeling of being somehow broken or wrong in the world has to do with problems in the world, not with you. Our conception of the world is built in stories. In fact, it’s theorized that our entire consciousness is built around our ability to construct narrative out of events. If our very personhood is created by story at a deep, biological level, you can imagine what happens to people who feel that they have been written out. Being a fan is enjoying the things I relate to and understand. Being a critic is in being able to see how myself and others may be written out of that story. Being a writer is about writing us all back in. You talk in your book about avoiding reading some reviews, but you also talk about changing your work in response to some kinds of negative feedback. So how do you balance that? There are times when I don’t read negative reviews at all. This is when I’m actively working on a project. Too many voices when I’m trying to make something can freeze me up. But when I’m in a good place, I’m happy to read stuff that’s… I wouldn’t say negative, but critical about my work. There’s a difference between a reader reaction like, “THIS BOOK SUX THIS AUTHOR IS CRAP” and a nuanced critique that actually engages with the text and wonders why you made the choices you did. The best reviews out there, for me, are from folks who assume I did the things I did on purpose, and then wonder why it is I did that, and pick it apart. That may sound trite, but I can’t tell you the number of times readers come to a work assuming that every choice a writer made was random. You mention Joanna Russ in your book as a writer whose criticism has inspired you. What other critics do you admire, and why is their criticism important to you? Media criticism – deep, insightful, and meaningful criticism – is in short supply these days, especially at the big media outlets. We see far too many hot takes and knee-jerk reactions and not enough in-depth analyses and contextual arguments. You can still find some good criticism in our genre, particularly from places like Strange Horizons. Adam Roberts wrote a great, meaty review of my novel God’s War there, which I’ve always loved. Folks like Abagail Nussbaum, K. Tempest Bradford, Mikki Kendall, and Foz Meadows are also doing some of the best media/culture criticism in the genre (and outside of it) right now. I also enjoy reading criticism from Niall Harrison, and outside of or tangential to genre, I love reading critiques of media and culture from Roxane Gay, Lindy West, Barbara Ehrenreich, and Katha Pollitt. Criticism allows us to step outside of the emotional space that a work creates and interrogate it in a more objective way. Yes, sure, everything is subjective, but criticism asks us to regard what we love or even what we hate (or what we’re indifferent to) and see it from a new perspective. Critical thinking in this era of mass disinformation is more important than ever. It’s all we have to combat the broken stories about the world that we’re served every day. Powering down for the night. 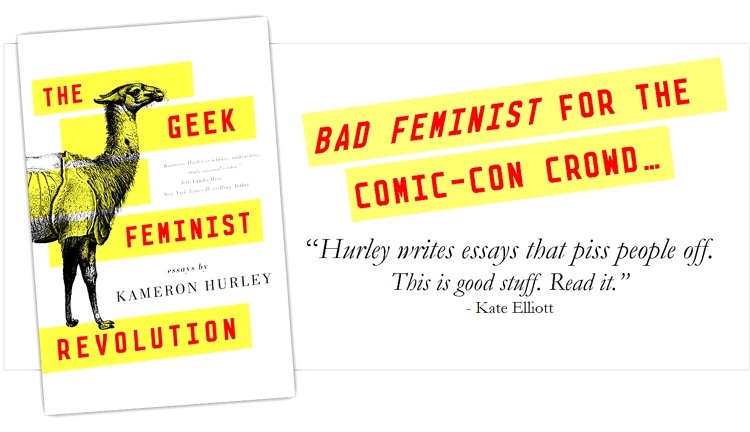 You can find Kameron Hurley on Twitter @KameronHurley, and buy Geek Feminist Revolution here.